Unlike Gallup's economic sentiment index, which has been leading other confidence indicators, the firm's job creation index seems to be less helpful in estimating actual job growth. While the jobs index has been rising steadily over the past 4 years, payrolls increases have stalled at under 190K new jobs per month on average. The Gallup's job index strength does tell us however that the employment situation in the US remains stable. The breakdown of the index indicates that layoffs have not been increasing while the percentage of employers hiring is at least stable if not rising. Moreover, the labor market weakness remains with the federal government, whereas private sector jobs seem quite stable. 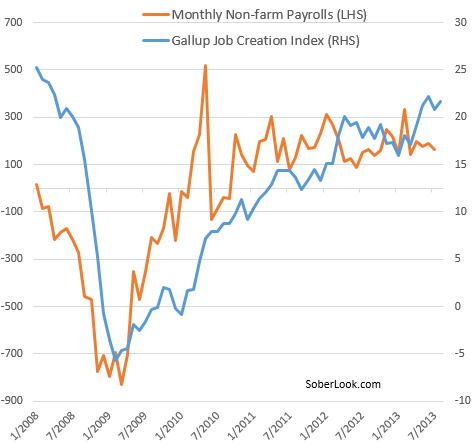 This is important because the Fed has been quite focused on private payrolls growth (among other indicators). The Gallup jobs index tells us that this Friday's payrolls report is unlikely to be shockingly bad and could even surprise to the upside. And we all know what that means for the Fed. Watch the ADP number tomorrow for a more reliable projection of Fridays US employment situation.